According to the "out of Africa" hypothesis, modern humans evolved in Africa several hundred thousand years ago. Then, from about 50,000 years ago, our ancestors ventured farther afield, ultimately settling worldwide. 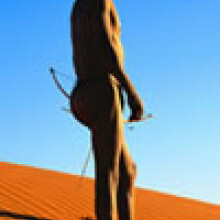 This is supported by genetic studies, which confirm that the richest genetic diversity is seen amongst African natives, and the least amongst those populations at the tips of the migratory branches early humans followed around the world. But now a scientist at the University of Auckland has added another layer of complexity to the story - the role that human language might have played in the exodus from Africa. Writing in Science, Quentin Atkinson analysed the number of phonemes - the units of sound that make up words - used in 504 world languages. As a general, rather like genetic diversity, languages spoken by large populations tend to have more phonemes than languages spoken by small or bottle-necked populations. Strikingly, this language phoneme count matches up very closely with the migration pathways predicted by previous genetic and morphological studies. The African languages are the most richly endowed with phonemes while those languages spoken by peoples at the distant tips of the migratory branches contain the fewest. The implication of this result is that, for the relationship to fit, language must have evolved amongst modern humans whilst they were still in Africa. According to Atkinson "to the extent that language is a marker of cultural identity, our cultural ancestry, like our genetic ancestry, can be traced all the way back to Africa, which I think is quite remarkable." And this acquisition of language is, Atkinson thinks, probably the catalyst that mobilised early man out of Africa. "Humans carried with them in their toolkit from Africa, language, and all the advantages that confers, including coordination and cooperation, giving us a competitive advantage." Parents who "um" and "er" in front of their children are in fact likely to be boosting their offspring's mastery of language. This week, researchers have found evidence to suggest that life evolved on land much earlier than previously thought. These fossils come from a key point in evolution where tiny, simple bacterial (prokaryote) cells developed features resembling larger, more complex (eukaryotic) cells which would make photosynthesis and sexual reproduction possible. According to the paper published in Nature, microfossils have already been found that demonstrate life existed in the sea over three billion years ago but very little is known about early signs of life on land. Paul Strother of Boston College and colleagues looked at microfossils found in billion-year-old rocks in northwest Scotland's Loch Torridon. The life-forms they looked at were eukaryotes: organisms whose cells contained complex structures inside cell walls, measuring up to a gargantuan one millimetre long. The authors say that because of the presence of structures like a nucleus, chloroplasts and mitochondria, these simple eukaryotes must have lived in fresh water and were exposed to the open air because they have the parts necessary to perform photosynthesis. 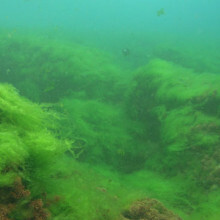 The authors argue that it also supports the idea that prokaryote cyanobacteria evolved first in freshwater habitats and later migrated into the sea. And early cyanobacteria are thought to be the cells which ultimately became chloroplasts in plant cells; or in this case these early eukaryotes, which are thought to be a precursor to algae. The authors add that what it could mean is that freshwater habitats are better at encouraging eukaryotic evolution than the sea. Chris - Also this week, how our early human ancestors talked their way out of Africa. There's a study marrying up the diversity of the sounds that are used in languages around the world with what genetics tells us about how people migrated out of Africa and across the globe. And it shows that it was probably the art of conversation that got people moving. Quentin Atkinson, the author of this new study works at the University of Auckland in New Zealand. Quentin - Ever since Charles Darwin, it's been recognised that the evolution of languages parallels, in many ways, the evolution of species. So you get this process of descent with modification. Like you get genetic mutations arising, you get what linguists called innovations in languages. And so, after a period of time when two populations have been separated, they can no longer understand one another, and you get new languages forming, just like you get new species forming when they can no longer breed with one another. So it was with that background I started looking at global patterns of phoneme diversity. Phonemes are sounds in languages. They're used to differentiate words with different meanings. So "cat" has a different meaning to "bat" because there's a different phoneme at the front of it. One of the key pieces of evidence supporting an African origin for our genetic ancestry is that genetic diversity is highest in Africa, and it decreases with distance from Africa. Chris - So you wondered whether the same thing would apply to language. Quentin - That's right. That pattern fits with an idea called the "serial founder effect." We expect an ancestral population in the homeland to have been there for quite a while and generated a lot of genetic diversity. And during an expansion, small groups will break off from that ancestral population and carry a subset of the diversity with them. And then, as the expansion continues, small groups will break off from those groups and carry a further subset of diversity. So the further out you go from the origin, the less diversity you see. Chris - How do you counteract the effect of population size? Because, obviously, with a small population, you have a small gene pool. You're also going to get a small phoneme pool - small number of ranges of different word sounds. That could be an effect of a bottle-neck in a population. It could also be just the fact that a population happens to be small anyway; so how do you get around that? Quentin - So, part of the motivation for looking at a serial founder effect in phonemes was that population size has been shown to be correlated with the number of sounds that a language uses. So languages with more speakers use more sounds. So that fits with this idea of a founder effect. So I was looking for a global decrease in the number of phonemes used around the world from some origin point. And you're right, one of the things you need to consider if you're looking at that is that this is not just a result of differences in modern population sizes. So if some parts of the world happen to have, on average, smaller populations, maybe any global patterns we see is just the direct result of that. So one of the things I did was control for modern population size and looked to see whether we still find a global decrease in phoneme diversity with distance from an origin, and the origin turned out to be Africa. Chris - How many different languages did you consider around the world? Quentin - In total, 504 languages. So they're part of a data set called the world atlas of language structures. Chris - Presumably you've got the whole world represented on a map of where people went in evolutionary time, and you've got the languages from those sorts of territories. When you marry the two together, do they agree? Quentin - Yeah. The pattern that we see in the phoneme diversity, the number of phonemes, matches quite nicely with the patterns we see in genetic diversity. So just like the genetic diversity points to an African origin, so too it seems does the phoneme diversity. Chris - So this is another strand of evidence that supports the genetic diversity. People have also done this with Helicobacter pylori - people in Cambridge have done that actually - and also the facial phenotypic appearances. So this is another strand of evidence, but does it actually show anything that those other investigations didn't, or does it fill any gaps that they were incapable of addressing? Quentin - I really think it does, because this is not some genetically inherited thing we're tracking. This is language. It's culturally inherited to the extent that our cultural ancestry, like our genetic ancestry, can be traced all the way back to Africa, which I think is quite remarkable. And that means that just as we're one big genetic family, we're also one big cultural family. Chris - But an even more fundamental question must be, are you suggesting that the thing which catalysed the 'out of Africa' migration, the thing that led to humans taking over the whole world, was that we actually got modern language? Because if the root of all languages is Africa and then they slowly diversify from there, that would suggest that people had to have that core language function first before they went anywhere? Quentin - That's right. It looks like, from these results I've presented, that humans carried with them in their toolkit from Africa language and all the advantages that it confers in terms of cooperation and coordination. And I think language therefore could've been key in giving us the competitive advantage that we obviously had over a lot of the other hominid species which we ultimately obliterated. Chris - Quentin Atkinson - he's based at the University of Auckland in New Zealand and he published the work you've just been hearing about this week in the journal Science. A team working in the USA and Holland have this week come one step closer to working out how a rider-less bicycle remains upright. As you know, this only happens when the bike is moving, so there must be some interesting mechanical forces at work keeping it from toppling over. What happens when the bike coasts is that, each time it starts to fall to one side, the front wheel will steer into the fall and so correct it - making the bike upright again. For some time the conventional wisdom has been that two principal forces cause this corrective steering to occur. The first of these is a sort of precession - otherwise known as gyroscopic torque. This is when something spinning in a particular direction provides a force that acts on the axis of the spin. For example, if you have one of those spinning tops where you pull a piece of string to make it spin, the spinning motion keeps it upright as gyroscopic forces pull on the axis to create a sort of self-correcting balance. When the top is not spinning, it simply topples over on one side. For a long time it's been thought that the same effect happens on the bicycle wheel. The second effect is the caster effect. 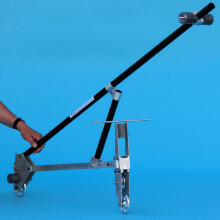 You'll see this on shopping trolley wheels where, when you steer it around corners, the wheels appear to get dragged around behind the direction you're steering it in. And this is because they're set on posts which are (if viewed from the side) in front of the position where the wheel meets the ground. The same thing is effectively true of a bike, because the place where the wheel meets the ground is actually slightly behind the steering axis. Publishing in Science, this team built a bike that counteracted these two effects, to see if it would still stay upright when moving. Jodi Kooijman and colleagues from Cornell and Delft University of Technology constructed a frame with wheels that spun in the opposite direction to those on the ground - counteracting the gyroscopic torque. And they moved the steering axis so that it sat directly above the front wheel; preventing the caster effect. But... when they let this construction roll alone, it still managed to balance upright. Further, it didn't lose its balance as it went faster - unlike normal bikes. The researchers think that there must be something else going on, possibly related to mass distribution. They also argue that, until we fully understand the mechanics behind them, bikes today could be falling well-short of their design potential. One person in every hundred has schizophrenia, and 85% of cases occur in families with a known history of the disease. But despite being so common, the causes of condition remain shrouded in mystery. Now scientists have found a new way to gain a fresh insight into the disease - by propagating patient's own nerve cells in a culture dish. Writing in Nature, Salk Institute scientist Fred Gage and his colleagues explain how they took skin cells from four schizophrenia sufferers and then, using a genetic technique, reprogrammed these skin cells to become stem cells, which they were then able to turn into brain cells that could be cultured and studied. 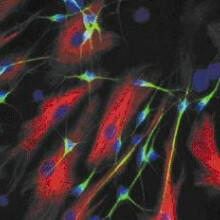 Compared with control neurones produced using the same technique but starting with skin cells from non-schizophrenics, the nerve cells produced from the patients showed reduced connectivity - in other words made fewer chemical connections called synapses - with other nerve cells and they also put out fewer nerve branches. The researchers also exposed the cells to a number of antipsychotic drugs used to treat schizophrenia; one, called loxapine, reversed some of the observed connectivity deficits. But even more powerfully, the team were also able to compare how the gene activity profiles of the schizophrenic neurones differed from that seen in the healthy nerve cells, identifying in the process 596 genes that were being expressed differently in the two cell types. One quarter of these have previously been tied to the condition, but the others represent new avenues that could be followed, including from a therapeutic perspective. Indeed, exposing the cells to the antipsychotic drugs produced significant changes in the activities of a large number of genes. According to Kristen Brennand, the lead author on the paper, "These drugs are doing a lot more than we thought they were doing. But now, for the very first time, we have a model system that allows us to study how antipsychotic drugs work in live, genetically identical neurones from patients with known clinical outcomes, and we can start correlating pharmacological effects with symptoms." 20:25 - Planet Earth: SWARM Satellites to Monitor Earth's Magnetic Field. Planet Earth: SWARM Satellites to Monitor Earth's Magnetic Field. Ralph - When I get used to the typical run of satellites coming through a factory like this, I think of the big telecommunication satellites as being like London buses. But for me, the SWARM satellites were like long, sleek, dark racing cars. Sue - Why was it built in that particular way? Why does it physically look so different? Ralph - Well I guess there are two principal reasons for that. One is the environment, the orbit, that the satellites are going to go into. 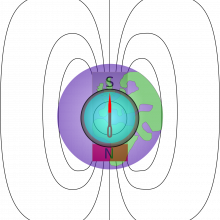 That's a relatively low orbit and it means that they have to be sleek, very slim, to help reduce the pressure of the residual atmosphere at the height it is orbiting at, and the other reason is that it needs to keep its sensors, its extremely precise and sensitive magnetic sensors, as far away from any disturbance on a satellite as possible. And therefore it's very long and actually extends its length by a 4-metre long boom. Sue - This 4-metre long boom then is the reason that it has been described as a giant mechanical rat, which, considering you and I both see it more as a sleek racing car, seems slightly unfair. Ralph - It does seem a bit unfair, but the tail of the rat, the boom if you like, is really very vital. It's on there so that we support what's called a vector magnetometer, the heart of each satellite, the device that is providing the very precise measurements, not just of the size, but of the very detailed direction of the magnetic field that each satellite is flying through. Sue - But because they're measuring the earth's magnetic field, that made the construction slightly different to how you would normally make a spacecraft. Ralph - We've had to be careful in every way we've been working - in our choice of materials for these satellites, and in the techniques we use. For example, we've got to be careful that nothing that we use is going to generate its own disturbing magnetic field. So the materials we choose are far from being the typical materials we would use for a telecommunication satellite. We've had to build this out of carbon reinforced plastic, we've have to use ceramic materials to form kind of an optical bench on which to support the vector magnetometer. And the tools that we used to do work on the satellites, we've have to make sure that those contain no residual magnetism themselves. Sue - Julia Ryan, you worked on the assembly, integration and testing part of the campaign for the Swarm satellite. What sort of testing did it involve? Julia - The most environmentally disturbing part of a satellite's life cycle is the launch because being on top of the rocket, it gets shaken around a lot and subjected to a lot of noise. In order to make sure that it's going to survive that, we have to do simulations on the ground using computers and then test it afterwards. Sue - Often all the components of a satellite aren't put together until launch. So how do you test a satellite when it perhaps doesn't have all the instruments onboard? Julia - When we're testing the structure, we use mass dummies to represent the different instruments onboard. These will be blocks of metal or plastic to represent the general size and weight of each instrument, and these bolt into the same insets that we would bolt the actual equipment into and it gives the representative mass and dynamic response of the spacecraft when we test it. Sue - You mentioned metal there. Did the metals and the choice of metals on the spacecraft itself have to be very particular to avoid the induction of magnetism? You don't want that because it would affect the instruments and what they're trying to measure. Julia - Yes, that's right. All of the metal components of the structure, for example the brackets and the fasteners themselves, all have to be made out of titanium whereas we would normally use perhaps aluminium or even stainless steel. These parts were made out of titanium to reduce the magnetic effects. Sue - Ralph, the three SWARM satellites are due for launch next year. Will they be launched in stages? Ralph - No. in fact, they're going to be launched all together from one rocket from Northern Russia. They're going to be put together into an orbit very close to the Earth's poles, two of them at a slightly lower altitude, flying almost side by side around the earth, with the other one a little bit higher and slowly drifting away over time to separate them in time and space from each other. Diana - Dr. Ralph Cordey and Julia Ryan from Astrium UK with Sue Nelson. There's also a longer version of that interview on the Planet Earth podcast and you can find it at thenakedscientists.com/planetearth. Diana - For Naked Engineering this week, Dave Ansell's been finding out how to solve the problem of powering the tiny nanoscale devices like medical implants that are currently dwarfed by the batteries needed to supply them. Helping to solve this problem is Dr. Zhong Lin Wang from Georgia Institute of Technology. Zhong - In the past 50 years, I have devoted my whole time to nanotechnology, making things smaller, better, higher performance, and hopefully cheaper. But when a thing becomes too small, having a battery drive it may not be the adequate choice. If you have a battery that's so large that it means the whole system is large, how do we miniaturise the size of the battery? That's one way, but the other way is, can we harvest energy from the environment because the power consumption of the device is small. The energy harvest may be enough to drive this. Dave - Is the problem that as a device shrinks, the amount of power it uses doesn't shrink as much as it's volume, so the equivalent battery wouldn't be big enough to keep it running for a long time. Dave - How are you going to replace these batteries? Zhong - Power consumption is in the range of microwatts to milliwatts. That's a thousandth to a millionth of a watt, that's the power needed to drive this kind of device. This working environment is exposed to light, heat, and mechanical vibration, to all kinds of disturbance we experience every day. So can we convert those kinds of small energies to drive this? Dave - I guess you're going to have to use different techniques to absorb different types of energy, so how are you going to go about it? Zhong - Solar and thermal, the most popular today, will go for larger scale applications. 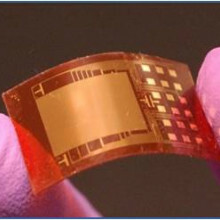 But when you have tiny nano devices, these devices are not always under the sun. It could be implanted inside a biological system or hidden in a room in the dark. But there's always mechanical vibration. When I talk to you, my voice is a vibration. Can we convert this into electricity? Dave - So how much power actually is that? Zhong - The measure is different for each source. For example, you have ultrasonic waves, you have mechanical x-rays. For example when you drive a car, inside of the tyre there's a lot of mechanical disturbance. When you walk in your shoes, you're tapping your shoes back and forth, those are generating mechanical energy. Just let me give you an example: how much energy do each of us have? You're tapping your finger, there's milliwatts. You're breathing, one watt. You're walking, 67 watts. If you can harvest a fraction of those watts, that's enough to power your present electronics. Dave - So you're just powering them from energy which is being wasted all the time, normally it just gets turned into heat. Dave - Practically, how are you looking at harvesting this energy? Zhong - Using nanowires, tiny nanowires, the diameter is about a 500th to a 1,000th of a hair's width, the length is about a 10th of a hair width, and then we put this on a rod of substrate to convert a tiny physical motion into electricity. And we can generate 3 to 5 volts output today. What is 3 volts? Two double A batteries. What is the power? The power can reach microwatts to milliwatts. You'll say, "That's too small." But for a lot of industrial applications, they're looking for that range. Dave - So how do these nanowires actually generate electricity? Zhong - These nanowires are not just any wire. They're a material called zinc oxide. It has a part called a piezoelectric part. So what is this? Piezoelectricity involves applying a force or pressure to produce a voltage inside a crystal. That voltage drives electricity to flow. That's the way you convert mechanical energy to electricity. Dave - This is working on the same principle as the gas lighters, where you deform a crystal that produces the thousands of volts you need to produce a spark and then that spark lights your gas. But in this case, you're using tiny nanofibres of a similar material. When these are bent, they'll add together to produce a useful voltage and a useful current. 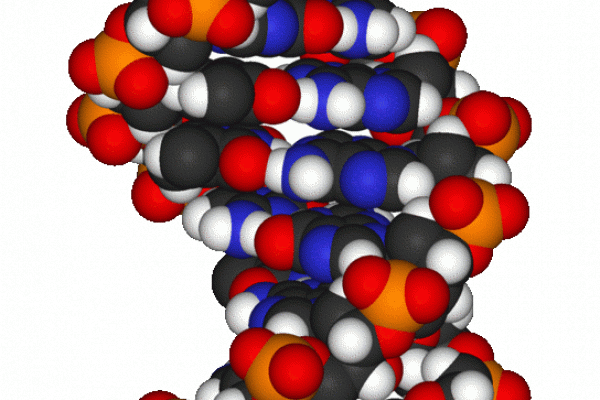 So when you've perfected these nanofibres, where are we actually going to see them? Zhong - This is a platform technology, just like you need the batteries, you need these things. I'll give you a number of areas - first, environmental detection. Are there any toxic gases present that we can't smell? You can make a self-powered sensor system that you can distribute around. So environmental monitoring, how do you track an animal, how do you track people, how do you track the product you shipped? Dave - So with all of these, the major limiting factor is the batteries rather than the actual technologies to do the detecting or the tracking. Zhong - If you dispose of a lot of batteries on the ground, the environmental damage that you will face in years to come will cost you a lot more. The other application is for medical purposes- implantable medical devices. Today, any materials used for batteries are biologically fairly toxic. And national security, if you have a thousand miles of border, how are you going to check those borders? Dave - So if you can make detectors so cheap that you can just throw them away and they will keep running for years on their own, it's very easy to build a huge sensor network. Zhong - In the future, we're going to make the sensor unit bean sized. We can distribute millions of these. Let's say 30% or 50% of them fail, it doesn't matter because as long as half of them work, they're all independent. Nano sensors work independently and self-sufficiently so we call them self-powered nanosystems. With self-powered systems, you don't need a battery. These work independently and wirelessly by themselves. Diana - Zhong Lin Wang from the Georgia Institute of Technology, exploring new ways of using kinetic energy from gusts of wind or wasted energy inside moving tyres to power a wide range of nanotechnology. Chris - An important group of diseases are those that occur when a person inherits a defective form of an essential gene, and this can cause tissues and organs to fail. Historically, there's been very little that could be done to cure people with this sort of problem. But now that's changing and a number of techniques exist to help people who suffer from some of these sorts of disorders. One of the pioneers in this field is Professor Adrian Thrasher. He's from Great Ormond Street Hospital and he's with us. Hello, Adrian. Chris - So first of all, tell us what sorts of diseases you're looking at. Adrian - We're interested in patients who are born with inherited defects of their immune system. So I guess the most familiar one to many people was the so-called "bubble babies" who were born without any immunity and who were very susceptible to common or garden viruses. Chris - What causes that to happen? Adrian - There are key genes that are involved in the growth and development of the immune system and if these genes have mistakes in them, mutations in them, then the immune system doesn't develop properly. So, these patients are often born without any lymphocytes, for example, that fight infection. Chris - The white blood cells. Chris - So, is it fairly easy to identify what the gene is that's causing that? Presumably, this is not a whole cluster of genes that are affected at once? This is a single gene which goes wrong which then causes those people to have that problem. Adrian - Yeah, that's right. Ten years ago we knew of a couple of genes that cause this type of disease, but now we've identified most of them. There are still a few out there to be identified, but we can pretty much identify the defective gene in the majority of patients now. Chris - But when a person has this disease, have they got just one gene which is not functioning, or have they got a range of genes at once which have gone wrong? Adrian - Again, it's variable. For the classical, what we call primary, immunodeficiencies then it's usually just one gene that is defective. But undoubtedly, there'll be more complex immunodeficiencies where several genes will contribute to that disease. Chris - So how are you trying to solve this problem? Adrian - Well, over the last 40 years we've understood that a bone marrow transplant is a very effective therapy for these diseases. So if patients have a good donor, within the family for example, we'd expect to cure these children very effectively. The trouble is if the patients don't have a good donor - and for those children the risks of transplant are considerable. So we, and others, have been trying to develop gene therapies which will be more effective and also safer. Chris - I think that was the situation that happened with David Vetter who was the American boy who was "the boy in the bubble". A donor couldn't be found in his case. He did end up with a transplant - I think from his sister - and unfortunately it wasn't a good match. Adrian - That's absolutely right. So he had the classical "bubble boy" disease and was maintained within a sterile environment until his early teens. He underwent a mismatch transplant and died of complications of that transplant. Those same complications exist today because matching transplants is still difficult. Chris - So how does gene therapy help? Adrian - Gene therapy helps because we are not dependent on using another donor so there is no mismatch. We can use the child's own bone marrow. And if we have effective ways, which we do now, of introducing correct copies of the defective gene into that bone marrow in a stable way, then in theory we can reconstitute their immunity using the patient's own cells. Chris - So what is the technique? Adrian - The technique is relatively simple. We harvest the bone marrow from these children under general anaesthetic. The cells are then modified in a special laboratory within the hospital, and then after several days, during which the cells take up the new genes, the cells are given back to the patients. So in fact, it's a very, very simple procedure and in some children we've been able to do that almost as an outpatient. Chris - So how do you get the gene that they need - the one that they have a defective copy of - how do you get the healthy working gene into their stem cells? Adrian - There are lots of different ways of doing that in the laboratory. The most effective way is to use a virus, because viruses have spent millions of years evolving mechanisms of getting genes into cells in an efficient way. We know we can modify these viruses to render them relatively safe and instead of the viruses taking their own viral genetic material into cells, they take the transgene - the therapeutic gene - into the cells. Chris - So you delete or remove the internals of the virus, the bit that would make more virus, put in the therapeutic gene, then you infect the person's own cells with that virus in a dish. Does it then insert that gene into their own DNA in those cells? Adrian - It depends what sort of disease you're trying to treat, but, for bone marrow diseases, we want the gene to be present in all of the blood cells for the lifetime of the individual, so it has to be stable. So, for that reason, we need the gene to be stably-integrated into the DNA of the haematopoietic stem cells - the blood stem cells - in the bone marrow. So yes, it is inserted into the DNA which means that when the cell divides, that transgene is also copied onto the daughter cells. 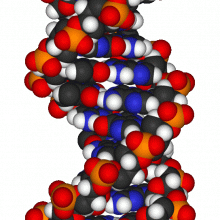 Chris - Can you control where into the person's DNA that virus adds that new healthy copy of the gene? Because presumably you've still got the old defective copy sitting there and you put the new one in somewhere else in their DNA? Adrian - That is one of the issues. At the moment, it's not possible to control that in a very efficient way. The clinical trials that are ongoing don't even attempt to do that, but we know from ongoing laboratory research that it may be possible to do that in a much more precise way and even, in some cases, it may be possible to correct the original genetic defect. Chris - That must carry a risk then. If you can't control where the virus delivers its genetic cargo into the person's genome, could that cause problems? Adrian - Yes, and it has done. We've learned from the first clinical trials that were initiated over ten years ago now that sometimes the transgene can affect the operation of genes that happen to be close by. So, for example, genes that control the cell cycle, or genes that can initiate leukaemia; so there is a finite risk to this sort of technology, although the sort of trials that we're conducting now have additional strategies whereby we try and lessen that risk. Chris - And when you put the now healthy (hopefully) stem cells back into the person, they home back into the bone marrow, take up residence, and start to make the kinds of blood cells and immune cells that the patient originally lacked. Do they then end up with a mixture of unhealthy cells and healthy cells, or do these new modified ones take over most of the cells in the blood? Adrian - It depends on the conditions. So in some conditions, the patients are born, for example, without any white blood cells. So any new cell that comes out is obviously a cell that has a transgene in. So in that situation, all the cells will be new functioning transgene-containing cells. In other conditions, we know that all you need to achieve is perhaps 10% of functioning new cells to correct the disease. And so that is what we shoot for. Chris - Just to finish up, Adrian. Is this something you have to keep doing many times throughout a patient's life or is one treatment sufficient? Adrian - For the sorts of diseases we're treating, we're hopeful that one off treatments - the same as a bone marrow transplant - should be sufficient for the lifetime of that individual. Chris - How many patients have you helped this way now? Adrian - We've treated over 20 patients at Great Ormond Street with these types of conditions. And worldwide now I would estimate that probably over 80 patients have received this type of therapy. Chris - And who are probably alive thanks to gene therapy. Adrian, thank you. That's Adrian Thrasher from Great Ormond Street in London. Diana - Gene therapy may help in the treatment of what are known as in-born errors of metabolism, where part of a biochemical pathway is faulty or missing and this can lead to a build-up of toxic waste products inside cells, damaging their functions. Professor Tim Cox is from Addenbrooke's Hospital in Cambridge where he works on these diseases and is developing new ways to treat some of them. So Tim, tell me what these diseases are. Tom - Well thank you. I mean, these are pretty severe diseases and we've taken a rather tough route to try and deal with them. They affect principally the brain, so these are neurodegenerative disorders that damage the neuronal cells and cause a compromise of the person who is unfortunate enough to inherit rare defects that cause them. So, typically, in the case of Tay Sachs disease, which is almost an iconic disease, emblematic of this whole class, the child is a beautiful child usually, born quite normal. But after a few months of life, starts to develop neurological difficulties with weakness, not able to sit up, problems with sight, swallowing, coordination, and it's a very progressive condition indeed. 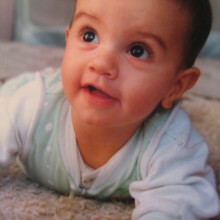 They often go blind and nearly all the children with this particular condition die in the first few years of life. We've seen quite a few patients over the last few years referred and it's quite clear that although in some populations this particular one is screened for, it still occurs, and it's no respecter of belief, ethics, or anything else. Diana - And what other diseases do you work with? Metabolic related ones? Tim - We work on Gaucher's disease which is a condition, an inherited condition, that principally affects the blood system, the liver, spleen, and the blood system very much like Professor Thrasher was telling you about earlier. But for that, there are alternative treatments in many cases, so you can provide the missing protein, which is an enzyme that can be targeted to the cells that are deficient, having a little address on it that's posted through the letter box of the cell membrane to deliver the corrective force, the corrective factor. But for the brain, it's a little more difficult and those are the ones that we've chosen the latter phase of our clinical research to try and tackle now because it's going to take a lot of work. Diana - So what have you done to explore new ways of treating Tay Sachs? Professor Adrian Thrasher was mentioning, we're able to, with a single treatment, have those animals survive to the 2-year span which is allowed for a laboratory mouse, and our colleagues in cats have had similar results in the United States. You can't work on cats easily in this country as you realise. Diana - So how is the vector different in this case then? Tim - Well it's a different vector. 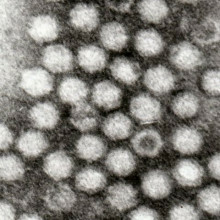 The virus is called the adeno-associated virus, a very tiny little genome and by putting in the proper expression motifs and the correct sequences, you can get expression of what we refer to as "household genes", that are needed to deal with the material that accumulates in Tay-Sachs, Gaucher's, other related conditions. The great advantage of this class of disorder, although they're absolutely horrible, is they do have a particular property in that it's possible to provide a factory, a little source of the corrective factor, in one small part of the brain which then diffuses this out of the corrected cells locally right throughout the brain and is distributed to where it's taken up - a sort of secretion recapture pathway. This is a very remarkable way of complementing a whole tissue, a massive super computer, which is how I think of the brain (other people's anyway!). It can correct it in a wide field. That's really, in a sense, the beauty. A terrible disease but there's a little trick of nature which you can exploit for therapeutic purposes. Diana - So how far away are you from clinical trials and actually putting this into practice? Tim - Well, I'm only 4½ million Pounds away! But we have applications in to the European Union and to government bodies in the UK at the moment, and - having done a great deal of work - in combination now we hope with a commercial outfit in Europe that we hope will be able to grow the GMP, the Good Manufacturing Practice safe vector, with all the toxicity done for human use. We hope very much in a year or two to actually start the first trials in this condition. Diana - Well, I hope your funding proliferates just like your description of the healthy cells. That's Tim Cox and he's from Addenbrooke's Hospital. Thank you very much. 46:39 - How can defective genes be turned off? Well, usually we don't need to turn off a defective gene because the nature of the mistake is usually such that the gene is off anyway. So if we put a functioning gene back in, that fixes the problem. In some cases it is necessary to turn off the defective gene and there are several strategies that can address it. So for example we can address it at the RNA level, so encourage RNA degradation by using homologous RNA sequences; or, in fact, you could target enzymes that will make deletions within that specific gene and thereby destroy it. 47:40 - Are there any problems where several genes need to be replaced? Are there any problems where several genes need to be replaced? Well, it's a very good point that the conditions, what we refer to as the single gene defects, are often not so simple, and that they have modifying factors and other genes that contribute to the development of what we refer to as the disease phenotype, the condition that you see in the patient. But, on the whole, there's a primary gene that we've chosen that's defective and which then drives the development of the disease. And when you put that right, one hopes very much that the other thing will fade into insignificance. So that's why, by starting in this area, we choose the definitive approach to major determinants that are predisposed to disease. That is, choose your weapons, and choose your targets first, I think. But it's quite true that, once we begin to understand diseases that have more complex genetic architecture, it may be necessary to tackle those and to think about a multi-pronged approach, focused in each case to the determining locus. But I think that's a bit far ahead. Let us deal with what we've got in our clinics at the moment before we start tackling the really complex things. 49:08 - How do you insert genes in the right place? How do you insert genes in the right place? Right, so there are several strategies. One is the "safe-harbours" within the genome. So the virus that Tim works on, adeno-associated virus, has developed a strategy of inserting itself into chromosome 19 in a very specific locus. We can use the mechanisms of that virus to put other genes into that same locus, and what we believe now is that's a very safe locus in which to put genes, so it's unlikely that any genes inserted there will affect surrounding genes. That's one way of doing it. The second way of doing it is a process of "homologous recombination", so using homologous DNA sequences to actually target a therapeutic gene into the right place. 50:23 - How do giraffes vomit? Alun - Well yes, that's a really interesting question and the answer is sort of yes and no. If you think about the giraffe's stomach, it's very similar to that of the cow and it's much more complicated than ours. So, a giraffe's stomach has four chambers. The first and second compartments are really big fermentation vats and the true stomach, their equivalent of our stomach, is the fourth chamber. So when we vomit, the vomit comes out of our stomach and then up the oesophagus, and obviously out of our mouths. In a giraffe, it would come out of the fourth stomach and it would sort of bypass the third stomach, and go into the first and second. It's extremely rare for the vomit then to go any further than that. So, in a sense, yes, giraffes can vomit, but it's very, very rare that it actually comes out of the mouth. Jonathan - I'm not an expert on giraffes as such, but of course, they are ruminants like cows and sheep, and other types of antelope. That is to say, they chew the cud. They have the capacity to regurgitate food from the main part of the stomach, the rumen, up to their mouths for further chewing to help the digestive process. So, the oesophagus, the food pipe of giraffes, quite naturally and frequently works in reverse to bring food up to the mouth. There is nothing physical that would stop it being sick. There are some plants that can make cows sick to evacuate most of the contents of the rumen out of their mouths. One is a small herb called cowbane, another is the rhododendron. It is not common, but cows that have been eating rhododendrons can be sick and we must bear in mind that the capacity of a big cow's rumen is anything up to 250 litres, 50 or 60 gallons. So this can be a spectacular site, especially if a whole herd of cows have found a rhododendron clump. I'm sure there are circumstances which could make a giraffe sick in the same way, and there would always be the danger of rumen contents getting into the lungs and causing a pneumonia. 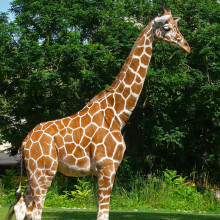 Diana - So, giraffes do regularly regurgitate food up their very long necks, though it's not quite the same as vomiting. Jonathan also added that giraffe vomit from the rumen would be quite different from our own since the rumen contents aren't acidic.